Have you ever considered people to be an endangered species — like the snapping turtle? 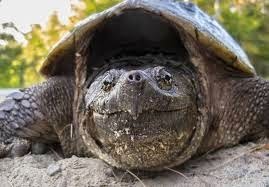 I read an article about an elderly man who’s hobby is rescuing turtles and recalls how he once was "endangered" himself. As a young adult, he became lured by his peers into a habit of drinking. Eventually, alcoholism threatened to destroy his life. He got so desperate that he cried out to God to rescue him. He saw God as his only hope — thanks to the early influence of his Christian mother and church background. He shared, how God had mercifully rescued him and had set him totally free from his addiction to alcohol. Ever since then, he claims, God's love has never ceased to be new and fresh every day. And that's why he is so full of exuberant joy. It's obvious that he is a Christian who dearly loves the Lord. This man has reasons to be sad. He lives alone. Few people come by anymore. They are busy in their own lives, he notes. But God is his companion, and that is why he is content. He shared how he often finds himself on his knees, crying out in praise and thanksgiving for God's goodness him. He says “I don't understand it! But I know he'll never forsake me now. Never!" He can see God's goodness on every turtle-rescuing mission — even if he doesn't spot any turtles. One time he recounts that he saw a bluebird one day instead. This is the kind of Christian that you and I do well to see — to remind us what real faith looks like. Reading about this man has inspired me: I want to have faith and joy like him. Dear Lord, thank You for those that bless us with their presence. Help us reflect their vibrant and mature faith that we may be eager to share that same way to those around us. In Jesus’ Name, Amen.